The Seasons Greetings 2015 Mystery Set was released on November 19th, 2015 in Disney Parks. 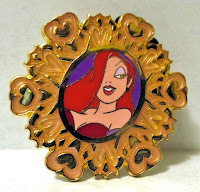 The set feature Disney Princesses Elsa, Anna, Belle, Jasmine, Tiana, Ariel, Jasmine, Rapunzel, but also includes Alice and Jessica Rabbit which are most likely the chaser pins. All the pins are shaped like a different snowflake, each filled with a different shiny color (not glitter filled as previous suspected). Jessica's border is pink with silver heart shapes. She is in a silver bordered oval in the center. The pose seems to be similar to her Valentine's Day 2005 pin. This is an Open Edition set hat includes two mystery pins and sells for $16.96 each.